This Winterport, ME church is now called the Winterport Union Meeting House. The building once served as a church but is now used for special occasions. There aren’t many special occasions in February. A cold wind blasts off the Penobscot River and slams into the steep bluff where the Winterport Union Meeting House was built in 1833. 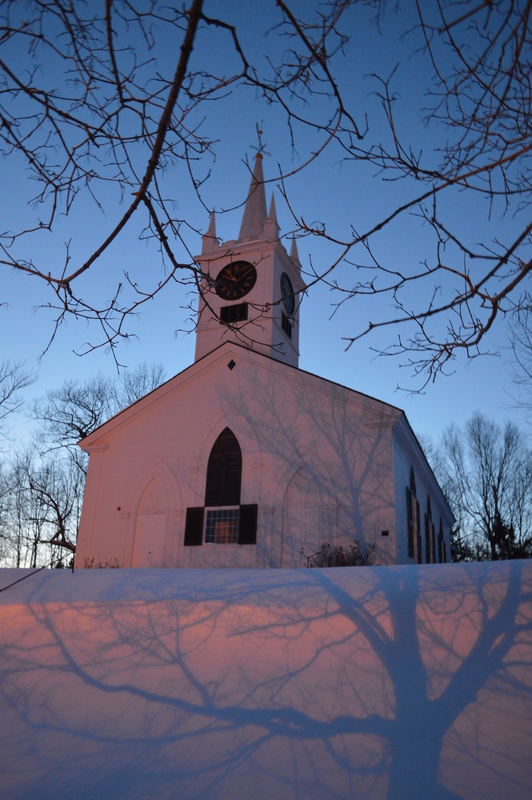 The bitter wind, slippery bluff, knee-deep snow and sudden winter darkness protect the old church from attempts to steal its mysterious beauty. Yes, the Photo Gods made me pay for this one. I traveled the half-hour down Route 1A from Bangor to Winterport three times in the last three months to make this picture. Each pilgrimage was met with unmerciful resistance. On the third visit finally got what I wanted from the place…and even then it meant snow in my boots, frost bite on my shutter finger and a race back to the warmth of the truck. The lesson: Don’t mess with a place called Winterport in February if the Photo Gods aren’t on your side. That’s a great photo and I’m glad you finally got it. Thanks guys. Let’s hope that’s the end of the snow pictures!